How To Choose The Right Contact Lenses? » How To Choose The Right Contact Lenses? Today, millions of people in the world wear contact lenses. The Contact Lens business is a multi-billion dollar business. The new user tends to get very confused with the myriad options available. We shall attempt here to guide the new user with some useful tips on selection of a suitable lens. There are two basic types of Contact Lenses - Soft Lenses and Hard Lenses. These are further subdivided into different types for specific purposes. 1. Hard Lenses: The most common of hard contact lenses are Rigid Gas Permeable (RGP) contact lenses. These lenses tend to give a crisper and clearer vision, and are more resistant to build up of impurities on the surface. 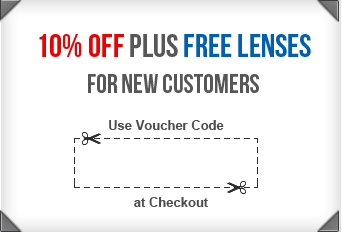 They are cheaper than soft lenses and are more durable and therefore last longer. However the disadvantage is that they can be uncomfortable to the user during the early days. They cannot be used while sleeping. 2. Soft Lenses: Since the human body senses the contact lenses as a "foreign body", contact lenses tend to cause irritation to the eye as a form of rejection from the body. Soft lenses allow the body to "breathe" by allowing oxygen and other trace gases to pass through the semi-permeable membrane thereby minimizing the irritation. Soft lenses are made of synthetic materials, mostly polymers called Silicon Hydrogels. The main advantage of soft lenses is that they can be worn while sleeping also, and can be used over extended periods of up to a week or more. The choice of the above two types is more or less a personal one - the wearer must decide on the comfort level for each type and make a choice. However, a word of caution here - always take a decision in consultation with an ophthalmologist. Here are 10 useful tips for making a suitable choice. 1. Refer to your Prescription: First and foremost, the prescription should be kept in mind while making a choice. Even though hard lenses may be less comfortable, that may be the only option as recommended by the ophthalmologist. 2. Know The Subject: It would be a good idea to do a bit of reading up on the topic. There is an abundant supply of material about contact lenses on the internet. Brochures are available with opticians. Another important source of information is from the users themselves. People who wear contact lenses will give you the most authentic information. 3. Consider Your Lifestyle: A frequent traveler would prefer continuous-wear lenses whereas an athletic person would find soft lenses more suitable. In any case, this aspect should be discussed at length with the ophthalmologist whose recommendation will also determine the type of lens to be used. 4. Eye Health: The eye, like any other part of the body needs to be kept healthy. While selecting contact lenses, make sure that they conform to local health standards. For example in the U.S., manufacturers have to comply with the Food and Drug Administration (FDA) which sets the standards. 5. Try them on: Trying out different types and sizes of contact lenses will help you to get the feel of wearing them and you will also get to see how you look. 6. Take your Time: Do not be hasty in acquiring contact lenses. This is especially important to the new user. It is advisable to take special time off for this. As this is a major decision in one's life, it should be given due importance. 7. Shopping Around: As there may be several outlets which deal in contact lenses, a market survey will reveal where the best deals are available. It will also give you an idea about the different types and qualities available in the market. 8. Cost Effectiveness: Though the most comfortable and trendy-looking contact lenses may be the first choice, they tend to also be the most expensive. So do make sure to take notice of the price tags. 9. Your Personality: This may come last on the list for some, but it is nevertheless still worth mentioning. A fashion-conscious person, for instance, might prefer tinted lenses. 10. Seek the Opinions of Others: Last but not the least, it is important to get feedback from friends and family, as those closest to you will definitely give you the right picture of how you look, whether you should go ahead with the decision and so on. So by now hopefully you will be in a better position to go ahead with the new project. Armed with this knowledge, you have now a good chance of taking the first step positively towards using contact lenses. How To Purchase Contact Lenses For The First Time? When Do You Need To Visit Your Optician? Do Contact Lenses Damage The Eye? For How Long Can Contact Lens Be Worn? How To Clean Hard And Soft Contact Lenses? Can Contact Lenses Be Stored In Water? Is My Contact Lens Inside Out? What Colored Contacts Should I Get? How To Remove Contact Lenses? How To Wear Contact Lenses? New Technology: What Are Hybrid Contact Lenses? Dry Eyes: How To Get Rid Of Dry Eye Syndrome? LASIK: How To Select Post-Surgery Contact Lenses?